See the World of EzineArticles! Our recently-released map feature allows you to view new articles, their authors and the authors’ geographical locations as they’re approved! The best way to experience the map is to try it for yourself at http://EzineArticles.com/map. 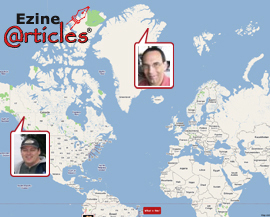 If you’re like me, you’ll soon find yourself watching with fascination as the map zooms to a new location and shows you the picture of another Expert Author in the EzineArticles family. IMPORTANT: You will NOT be featured on the map if you don’t have an author photo uploaded to your author bio, so now would be a great time to get it done! * As much as we’d like the map to be true “real time”, it’s just not practical. There is a constant ebb and flow to article approvals, so at peak times the map would be unwatchable due to the high volume of approvals. At other times, lucky individuals would be given the unfair privilege of appearing on the map for long periods of time. To solve this dilemma, each approved article goes into a queue which is metered out at 6-second intervals throughout the day. That`s cool. I never even knew the map existed. A like that, very educational, can you link it to show trends/ themes? Like google trends? Not at the moment, though I have brought your idea to the attention of our developers. Perhaps a future upgrade. Very cool! You guys are always coming up with fantastic ideas. Do you like your new quasi-futuristic clothes Mr. Powers? Very nice new feature. Congrats! It’s all very clever, but, um, what’s the point of it? Uhm, no point at all. Phase 2 of the map is in progress and will be released soon. Hey this makes a nice screen saver, just leave in on that page while on the phone, reading and/or doing research for your next articles. This is too cool! Lance using the map as a screen saver is a fun idea.